Hailed as “fun, action-packed and exciting” (Scott Mantz, Collider), director Travis Knight’s thrilling new film BUMBLEBEE is out now from Paramount Home Media Distribution, just in time for those Easter Baskets! Bumblebee + DVD + Digital HD- $22.96 & FREE Shipping on orders over $25 shipped by Amazon. DJ Bumblebee - Singing and Dancing Bumblebee - $29.98 & FREE Shipping. Energon Igniters Nitro Bumblebee Action Figure- $19.99 & FREE Shipping on orders over $25 shipped by Amazon. 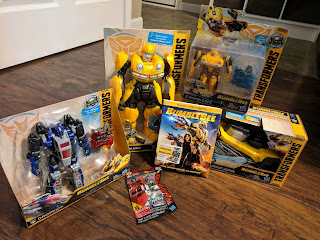 I grew up with Transformers, my brother loved the cartoon and we had a house full of the toys, so I have been a fan for years. I was so excited to see this movie and it didn't disappoint. I personally thought it was the best in the Transformers installment. The music in this film was amazing, total nostalgia! Bumblebee is prequel to the original 2007 Transformer movie and helps to explain the origins of the “Transformers” saga. The movie starts out with the Autobots engaged in a Great War with their the Decepticons, and must leave their home planet of Cybertron. Optimus Prime, sends a scout named B-127 (Bumblebee) to Earth to scout the area and set up a base of operations. From there we learn more about B and really fall in love with the character. The movie is action packed and full of laughs. If you are a Transformers fan, this is for you! Disclosure of Material Connection: I received the above mentioned item for mentioning this movie release on my blog. Regardless, I only recommend products or services I use personally and believe will be good for my readers. I am disclosing this in accordance with the Federal Trade Commission’s 16 CFR, Part 255: “Guides Concerning the Use of Endorsements and Testimonials in Advertising.